These books have often been subject to significant wear and tear, accompanying their owners on travels, sometimes being used for scribbling down quick notes, sometimes as coasters for hot or cold drinks. It is in fact amazing that so many of them are still in such good condition as they often are. The first thing you might notice is if the spine (or sometimes the whole book) has faded. Usually, the dye used was very photo-resistant but this may have varied from time to time. Or maybe some people just have their bookshelves facing south windows... 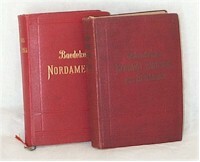 Note also that some editions in 1889 were bound in an experimental, pink cloth cover. Another very noticeable feature is the brightness of the gilding. Mostly, the gilded cover text is very bright, but some editions, especially in the 1920's, seem to have been made with inferior materials. Probably it was difficult to source good-quality supplies at the time. The picture to the right shows two editions of approximately the same age. The 1904 Nordamerika looks extremely good for its 100 years - but on the (8 years younger) Norway, Sweden and Denmark edition, the title can hardly be read at all. The weakest and most exposed part of the book is the spine. This is where damage generally shows. 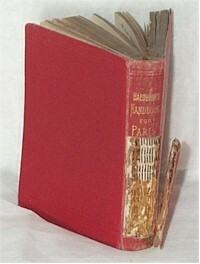 It will start as cracks along the hinges, and finally parts of the spine might even fall off, as on the Paris edition here. This is obviously not good at all. Sometimes you see more or less successful re-binding attempts - occasionally even incorporating parts of the original spine or cover - but that does tend to reduce the value of the book significantly. It is also worth checking the inside of the covers. 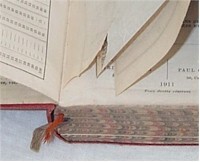 It happens that the external side of the spine looks in good order, while on the inside, the pasted down endpaper has cracked apart from its neighbouring leaf. This is a sign that the book is beginning to fall apart. Having said that, the books are well bound and, if you avoid handling a book in this condition roughly, it will not deteriorate further and will remain a good reference copy. Most important of all, check that all maps and plans are present. Far too often, someone has taken a fancy to a beautiful map and has cut it out to display separately. You may even see cut out maps for sale sometimes - needless to say, this is not something that should be encouraged! The maps and panoramas were often very intricately folded - indeed some large maps are wonders of paper engineering. And just imagine the effort involved in assembling and binding each one in its right place... However, this often means that the maps have small tears. It can't really be helped and short tears must be expected. Another effect is that maps are often misfolded. This wouldn't matter so much if it weren't for the fact that they then often stick out prone of the other pages, and therefore easily get damaged. Check also with this site whether the edition is supposed to have appendices of various kinds. Anything that was bound in should still be present, though you may have to accept that loose supplements are gone. This site makes reference to "BDKR condition". This is simply the standard to which the editor himself likes his Baedekers to be. It is also the condition which is assumed for the guideline pricing on the individual edition pages. This is far from "mint" or even "fine" - old Baedekers very rarely are in mint condition, and in a way, it adds character to the book if you can see that it has been well, but carefully used. Sometimes you can find a theatre programme, or a museum entrance ticket tucked away inside the book. Sometimes somebody has scribbled down an important phone number, or a meeting place and time on an endpaper. These things just add to the charm of the book, in our view. However, there are some things we should demand of a book in BDKR condition. Its spine must be intact, unless it is older than, say, 1880, but then it may only be starting at the hinges, no major breaks would be acceptable. It should not be excessively faded. The gilding, on the other hand, may be dim - this is unavoidable for some editions. There may be some staining on the cover, if it is not too obtrusive, but no stains on pages. However, we don't mind pencil annotations, as long as they are not excessive. Ink, except perhaps for the owner's name, is not on, though. Some foxing of pages may be unavoidable, but any loss of paper would be a strong minus point. All maps, plans and panoramas must be present, as must all bound-in appendices. One might tolerate the loss of a loose supplement, especially when it is known that it is rarely present. Normally, we wouldn't tolerate detached maps or pages, but if the book is very old, we might make an exception. There may be short tears in folded maps or panoramas, but nothing major. A book that is in this condition would probably be called "good-to-very good" in an Anglo-Saxon bookshop, or "Zustand 2" in German-speaking countries. On this site, each edition has been assigned a guideline price. This is the price you might expect to have to pay for a copy in "BDKR condition" from a bookdealer who knows his Baedekers. Of course, there may be many reasons why the price you see in real life will vary from that shown on this site. Some dealers have very large stocks of Baedekers, and then you will have to pay for the convenience of being able to come in and find the edition you have been looking for straightaway. Some dealers may not be particularly interested in Baedekers, and some may have very cheap premises and require less mark-up. So please take these prices with a pinch of salt. In any event, the really rare editions - those with a guide price of �1000 or more - are very hard to assign a market price to, simply because they are so seldom seen. The guideline pricing was set from a market survey of nearly 10,000 books during the autumn and winter of 2004/5. In February 2012, it was updated and improved on the basis of 24,000 sales records from eBay and other online auctions. 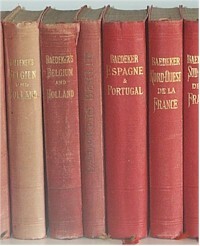 To help assessing the likely prices for very rare editions, a comparison was made with the guideline prices quoted by Hinrichsen in the standard reference bibliography. It is, incidentally, noticeable that some editions have become more sought after since the 1980's. The German editions seem to have become relatively more expensive, as have some city editions (especially Paris). The very oldest editions, too, have pulled away from their younger relatives. As for the online auction prices - well, they vary wildly. We record all prices achieved, regardless of condition. Even so, the price for what looks like copies in the same condition can vary from day to day, depending on how well they are presented by the seller, or perhaps just on the number of collectors happening to see the auction. Obviously, the auction prices will give more of a steer, the more records there are for a given edition. Generally, it looks like auction prices average about 40% of the BDKR condition guideline price, although they can approach the guideline for rare editions.